I just want it to be Spring, so for inspiration I've been looking through Spring and Summer on Vogue's website. I'm just honestly so tired of winter, I want to start wearing cute dresses and sandals. For this nail art, the design was inspired by Alexander McQueen's Spring Ready to Wear 2014 collection. 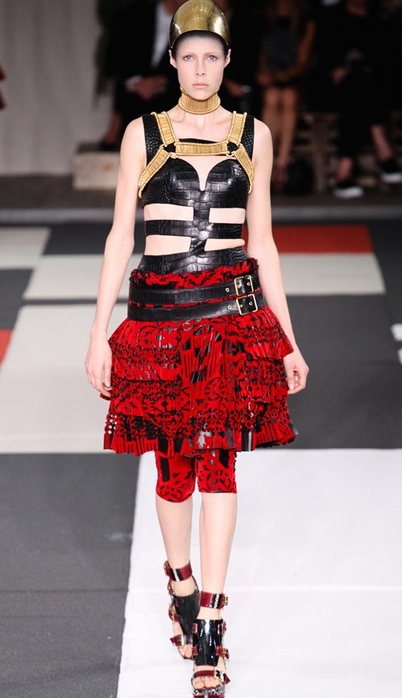 The collection has a lot of primary colour and what I would consider as rocker chic. There are a lot of cool intricate patterns and leather too! I tried to represent the design as best I could. For this nail art, I used a couple of special finish polishes, one being latex finish the other was a matte top coat. For the red patterns, I painted my nails red and used my black gel pen to draw out the patterns. Next I used a matte top coat to create that dull look. 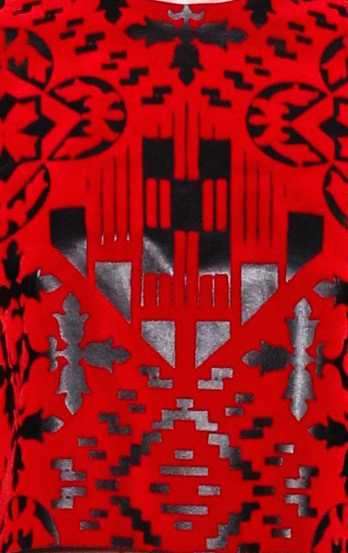 On the dress, it looks like the black cut outs are made of leather so with my nail art brush dipped in black latex polish, I simply traced on the patterns I created with my pen. On the black leather pattern, I used the Bundle Monster image plate with the "crocodile skin" image. First, I painted my nails with latex black polish. Then I transferred the crocodile skin image onto my nail and allow it to dry. Since the black special polish was hardly noticeable on my nail, I used it as my guideline instead. With a black glossy finished polish, I traced along the lines to make the pattern stand out. I think the design turned out surprisingly well. I hope you enjoyed this nail art, let me know what you think! So creative as always! I LOVE red and black together! like this :) cheeeeeers!! xoxo!